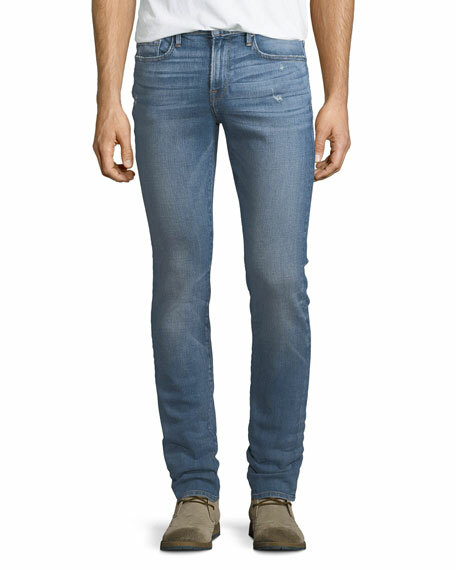 FRAME "L'Homme" slightly distressed denim jeans in Beaudry. AG Adriano Goldschmied "Dylan" slim-fit jeans, eased in the seat and thigh. 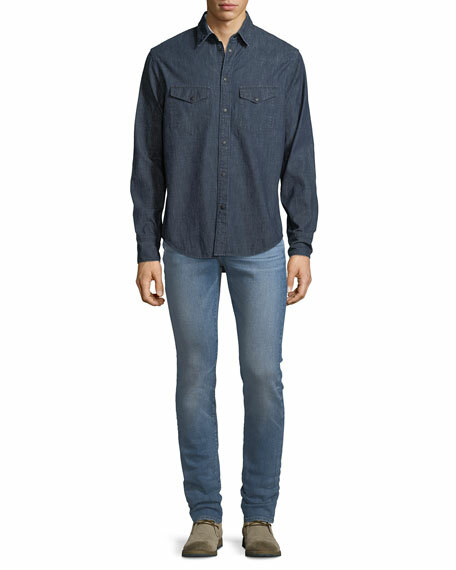 Comfort-stretch denim, aged to mimic look/feel of 28-year-old jeans. Classic five-pocket style with contrast stitching. Button/zip fly; belt loops. Cotton/spandex. Imported. Model's measurements: Height 6'1"/185cm, waist 32"/81cm, typically wears size M.
EXCLUSIVELY AT NEIMAN MARCUS FRAME "L'Homme" style jeans in Chimney Rock (black) wash. Five-pocket style. Slight fading and distressed details at thighs. Skinny-leg fit; tapered at ankle. Button/zip fly; belt loops. Cotton/polyester/Lycra?? spandex. Made in USA of imported materials. Model's measurements: Height 6'1"/185cm, waist 32"/81cm, typically wears size M.
FRAME "L'Homme" style jeans in off-white wash with tonal stitching. Five-pocket style. Skinny-leg fit; tapered at ankles. Button/zip fly; belt loops. Cotton/polyester/spandex. Made in USA of imported material. Model's measurements: Height, 6'1"/185cm, waist 31"/79cm, suit 40, shirt 15.5x35, inseam 32"/81cm. 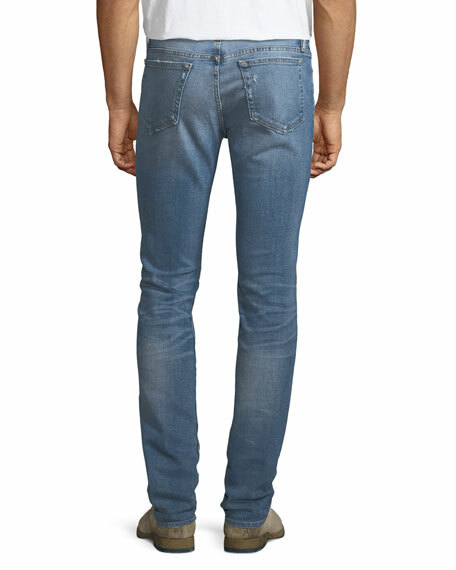 FRAME "L'Homme" jeans in light-indigo denim with subtle stretch. Approx. measurements: 10" rise; 32.5" inseam; 13" leg opening. Gentle fading & whiskering. Natural rise; belt loops. Five-pocket style. Button/zip fly. Skinny silhouette. Cotton/polyester/spandex. Machine wash. Imported. Model's measurements: Height, 6'1.5"/187cm, waist 32"/81cm, suit 40L, shirt 15.5x34, inseam 32"/81cm.